Kaeko Freenote is a talented, live singer with a sweet, soulful voice that you will instantly warm to. 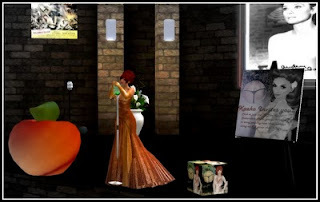 I had the distinct pleasure of attending one of Kaeko's live shows in Second Life recently and afterwards, I was honoured to spend some time with Kaeko to have a chat with her and to meet her SL family. Kaeko invited me to her home - a delightful little trailer set amongst an orchard of peach trees (more about that later!) where I joined Kaeko and one of her loved ones, Carson Wylie for a chat. This evening, Kaeko performed at Hepburns, a club where she has only sung a couple of times. Kaeko considers her 'home' venue to be 'Smooth Jazz Club', "The venue owner, Maebh Jewell, is an amazing person. She found me and 'rescued' me from just a dreadful venue, that treated me horribly. She heard something in me. She has always been laid back, professional, friendly and encouraging. I asked Kaeko if this felt like a rebirth of sorts for her. "Well, in a way I've had two rebirths at Smooth. First was her finding me at all and welcoming me to sing jazz standards, which I really prefer to pop and alternative. And also giving me somewhere I felt welcomed and appreciated and just...home. And then, after I got sick and had to leave for a while and had my surgery and all that, she welcomed me back with open arms. I could sing again, something I wasn't sure I'd ever be able to do again. So that was really an SL and a RL rebirth, through Maebh and Smooth and SL." "She is brilliant. I can't imagine anyone I would rather sing for..."
Kaeko has branched out and written some of her own lyrics and one day, she would love to be able to hear her own music and to try it on her own audience. "Because of my Chiari Malformation, I have never been able to learn an instrument. It effects the part of the brain that handles the fine hand/eye coordination it takes to play. Sometimes I think it would be wonderful to have a live pianist or guitarist that I could sing with, so we could create music together." "Theres something about the energy of two artists thats intoxicating..."
Our chat is momentarily but pleasantly interrupted by a lively bundle of energy, also known as Kaeko's son, Cable. Little Cable greets us all before running off as quickly as he bounded in, his mind fixated by other, less 'adult' endeavours. Kaeko smiles at her son as we continue our chat. Kaeko's taste in music is varied, although she has no particular favourite genre of music. "I don't have a favourite style, persay, but its what I studied in real life. Jazz standards, choral pieces and Broadway. So my style is more tuned for it. I do enjoy my pop shows. We have fun!" Kaeko's pop shows have an extremely universal theme - the theme of SL love. "Moving from the moment you see each other and feel that spark, to the passion, to the doubt and jealousy, to the insistence of self-strength, to the trip and sobbing over the one who got away, to finding yourself again. To me, thats such a common, common theme in SL. Almost everyone knows it, almost everyone understands and can relate"
Kaeko laughs, "Its funny. I ONLY sing in the shower when I'm sad or angry and haven't found words to capture it yet. And then you can hear me singing 'Noone Knows Who I am' from Jeckyl and Hyde or 'Need A Place' from Secret Garden. "My mind works, and sound comes out of my face without my knowledge or permission..."
An evening, an hour, even a few minutes with Kaeko and her beautiful voice will inspire you to believe in the words as you listen to them escaping her lips. Her songs are chosen especially by the lady herself, "Songs that touch you because you know that situation, that feeling, thats the common factor for me." You can find Kaeko in Second Life and on Facebook. Oh, and if you attend one of her performances, you will not only leave with a lingering smile on your face and sweet memories in your heart, your head will be FULL of facts on peaches....Kaeko loves them!! Kaeko, thank you for your gift and once again, thank you for sharing your voice, your time and your family with me. YOU are the sweetest peach in the garden.